emb-phones has no other items for sale. 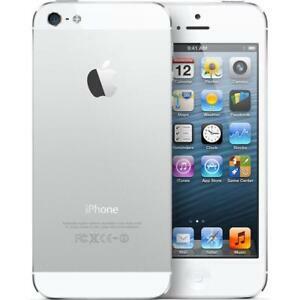 Attractive, sleek, and brilliantly designed, the Apple iPhone 5 16 GB model is everything you hoped it would be and more. Apple created a slimmer design and larger screen and pairing it with an aluminum outer casing of the iPhone 5 makes allows it to be thinner and lightweight. The larger 4-inch touchscreen display makes it easier to view content on the Web, play your favorite games, or for enjoying FaceTime chats with family and friends. The 8 MP HD camera allows you to take amazing photos and videos, even when lighting conditions are low. This Apple iPhone also features a faster A6 processor so you can enjoy downloads at a faster and more consistent rate. The 16 GB storage capacity gives you lots of room for storing your favorite items and you can quickly transfer them to the space-saving iCloud application. Enjoy all the wonders of this iOS-driven device like never before with the intuitive iPhone 5 unlocked smartphone. This device is compatible with T-Mobile, Cricket, metroPCS, AT&T Carriers. Battery Standby Time Up to 225hr. There are 250 items available. Please enter a number less than or equal to 250. Quick response and fast shipping. Perfect! THANKS! This iPhone is really quite nice for an older version iPhone. Excellent phone quality. Power button had gone bad, but was able to have that repaired. Takes excellent pics outdoors. Those taken indoors not the quality of my cameras, but for something to throw in my purse & not have to lug around my camera, it does fine. I was very happy with this phone initially- super good condition from what I could see. I spent hours setting it up and transferring contacts, photos etc. Then the phone died at 20% battery and will not recharge. Huge bummer. Very quality purchase when I was in a pinch and needed a fix. Plus battery life, cosmetic dings were very minor, overall very happy with this purchase. The sole problem I have with the phone is a weird screen glitch that sometimes makes typing (and simply registering the screen) impossible. It's normally fixed right away with a quick hold-button reset, but it can still be a nuisance. 4/5. great product only negative thing is battery life problem. This item is iphone 5 and it is in excellent condition, there are not any single scratches or any spot, it is look like just come from the apple store, I mean it is a new phone never been used or it has been really good taken care of. It has been one week, everything works great, only thing is battery life is very weak. I have to charge it every day but when I searched about this, I read many iphone users have same problem, It is common problem in iphone 5. But I read about if I reset the settings battery life may improve I did it and I think it improved little bit. But I may need to take it to the apple store to solve the problem. Overall, I am very very lucky to have this phone !!! A great performance and design but now a little slow and soon with the release of iOS 11 no longer will be upgradable. as the iPhone 4 will be obsolete soon.